KOG Games, a leading developer and publisher of popular free-to-play action MMORPGs, today launches into the holiday season with two massive and mech’d out events. Elsword starts the party off with a huge, North American premier birthday bash for Eve, the Queen of the robotic Nasod! Being the Queen of a doomed race of robotic warmongers can really get a girl down, especially after losing a war over scarce resources to the humans. Eve finds out that her King has gone corrupt and convinced the entire race to disregard her very presence. Then, he restarts the war with the humans (including you and your newfound friends), and causes the last of the Nasod race to get run down to the very last bot. So, what’s a robo-girl to do now; right…? 3 years have passed, and it wasn’t until now… Eve realized that no one has ever done for her what her young friends have done. Experiencing adventure, sacrifice, victory, seeing their tears, their happiness… they’ve shared all of these with her; this robotic, cold Eve. Eve can not only see the love and friendship they’ve shared together… she can feel. Eve’s friends throw her an awesome Birthday Event! 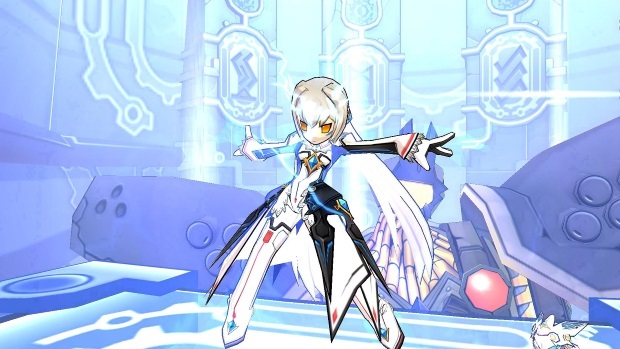 For starters, you can check out the exclusive Elsword NA in-game quests and events. KOG Games will also be exhibiting some amazing new Eve character illustrations, prizes and a premier Nasod Queen tribute video that has never been seen anywhere else in the world. They will be giving away over a thousand dollars in Eve-Themed prizes and merchandise. From In-game K-Ching, life-Size Eve Pillows, Eve USB drives, Elsword 2015 calendars, Eve coffee Mugs, and more, 1163 players will win. You can’t go wrong with Elsword Swag and K-Ching! But wait! There’s more… For those end-game players who aren’t into cake, how about a Raid unlike anything you’ve ever seen before? 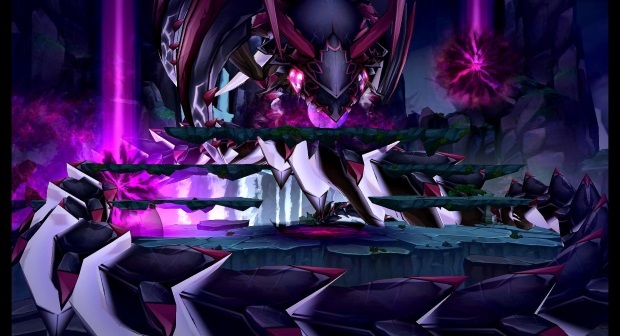 Drabaki, The Warden of Darkness, is Elsword’s new Raid Boss. Drabaki rends the very ground beneath him as he tears towards our heroes. This is a Raid Boss encounter that allows up to a remarkable 12 players join in to fight Drabaki together! Sounds easy right? On the contrary! You have to bring your “A” game. Though you may take Drabaki on with a party of 12 players, you only have 12 minutes to destroy this gargantuan monstrosity or lose. Oh! Did we mention that he was huge? Drabaki’s epic coils, flaming purple poison and tree-sized bladed tail are large enough so that all twelve players are getting hit from all angles; it’s hands-down, the toughest fight in the game. The rewards are epic. Drabaki has a small chance of dropping the very rare Jewel of Drabaki; an awesome +9 Weapon. As well, players who defeat Drabaki will receive a Title with some wicked stats, a Raid Boss Cube with Random prizes, high level crafting items and more. Party down with Eve and the Elsword crew, or declare war against Drabaki, the biggest and baddest Raid Boss in Elsword history. The Nasod Queen beckons ~ You better Mechanize! The master of death and decay, the Necromancer, is coming to the MMORPG Eudemons Online.